The first five people to leave a comment will win a book! Thank you! Now through April 30th Parent Perks, Inc. is matching book purchases from The No Biggie Bunch series with book donations to the U.S. Public Library of the buyer’s choice. It’s easy and there are two options for purchase. 1. Library 50-50. When customers purchase two books for their own bookshelves, the publisher will send two additional books to the U.S. Public Library of the buyer’s choice – free of charge. The second purchasing option is the Library 100, which provides a public library with four books from The No Biggie Bunch series – two purchased by the customer for donation, plus two Parent Perks, Inc. will donate. All libraries receiving books will be given a note from Parent Perks recognizing the buyer’s donation and the buyer will be sent a note of acknowledgment from The No Biggie Bunch. 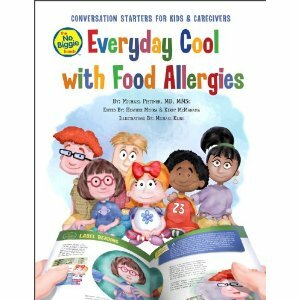 Everyday Cool with Food Allergies: Conversation Starters for Kids and Caregivers by Micheal Pistiner, MD, MMSc, edited by Heather Mehra & Kerry McManama, illustrated by Michael Kline. This is a great introduction to food allergies and to the No Biggie Bunch series. Because kids with food allergies are so prevalent at school, this would be a great book to read for any child starting preschool or Kindergarten especially those who have no food allergies so that they understand how to keep their classmates safe and learn empathy for those who do. Peanut-Free for Three by Heather Mehra & Kerry McManama, illustrated by Michael Kline. This book brings up a very good point: opened jars of jelly or jam can often contain remnants of peanut butter in a household where no one has a nut allergy. Peanut butter and jelly just go together, right? And don’t most of us use the same knife when making the sandwich? I know I do! We also meet other kids in the No Biggie Bunch with other food allergies. Greta is allergic to gluten, Paige to nuts, and Eliot to eggs. Trade-or-Treat Halloween by Heather Mehra & Kerry McManama, illustrated by Michael Kline. Greta’s gluten allergy means that she can’t eat all the candy she collects at Halloween trick or treating but it’s no biggie because her parents have a trading system of safe treats for candy with gluten that she’s excited about. Sports-Tastic Birthday Party by Heather Mehra & Kerry McManama, illustrated by Michael Kline. I know that finding safe snacks can be an issue if you are the snack mom at preschool or it’s your turn to bring the snack for a sports team. In this case, Scott’s sports birthday party navigates the issue of cake that is safe for his friends with allergies. Dairy-Free Dino-Licious Dig by Heather Mehra & Kerry McManama, illustrated by Michael Kline. Davis is allergic to dairy so when he needs a snack, he understands that sharing snacks isn’t safe for him. To view any picture book more closely at Amazon, please click on image of book. To purchase book and participate in library donation program, please go here. I will be giving away this entire set of books. If you would like to win a book, please leave a comment with the title of the book you want. Thank you! Parent Perks, Inc. is a publisher of educational and entertaining children’s books. We believe when children are engaged and empowered, they can receive messages that stimulate imagination and promise transformation. Our publications embody the spirit of children and spark their social, interpersonal and intellectual innovation. The No Biggie Bunch is a group of kids who are diverse in their food allergies, ethnicities and interests – all the things that make kids special. Kids with food allergies are still kids by definition – kids with equal need to stay safe and have fun. The No Biggie Bunch adventures provide creative solutions and responses for school, play dates, holidays, birthday parties and more. The No Biggie Bunch was created by authors Heather Mehra and Kerry McManama. This book is very helpful. Especially to those who are experiencing food allergy (just like me). I hope this book could also help adults too! Glad you liked these books! I love the idea and concept that you have here! You both at the same time you help. A lot of people will benefit from this. Thanks for sharing this to us and i’m looking forward to read more from you! You are very welcome! I love that these picture books also help kids, both with allergies and without, feel more comfortable about how to treat their classmates and friends with allergies. It also helps keep everyone safe. The book donation is a wonderful bonus! The books sounds interesting. It just don’t tell about allergies but also would give lessons to both the parents and the kids. I like how you made the book. Very catchy to the eyes of the kids. I think it’s a wonderful set for kids and should have a place in every school library! Yeah.. Everybody knows well that children books are simple but it is full of knowledge that you can share with the children. The moral of the story in the story books can be very useful learning for them. I can tell you like children’s books too! You are entered to win. What a great idea you have here! (btw, enjoyed your input on Wed. chat). Dairy Free Dino licious Dig looks like it might be a riot. I hope you get a lot of response with the library project. Thanks so much! You are entered to win! I love these! I can’t wait to buy them. Both of my boys have multiple food allergies and I love the thought of other kids being exposed to what they go through in a way that they can understand. Thank you for sharing them. You are so welcome. I love how these books educate and help kids develop empathy too! Forgot to add that my son would love the dino dairy one.